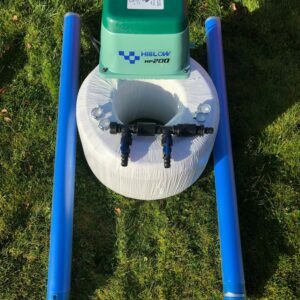 This kit supplies 600lr/min of air through 100m of braided hose to 6 x 1 metre fine-bubble air diffusers. All fittings are included. Suitable for large areas of water. 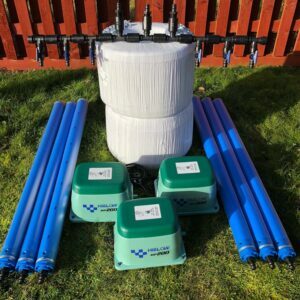 If you would like to personalise the kit by adding pumps/diffusers or pipe then please contact us and we can design an aeration kit just for you. Hiblow pumps come with a 2 year warranty. This kit supplies 400lr/min of air through 50m of braided hose to 4 x 1 metre fine-bubble air diffusers. All fittings are included. This kit supplies 200lr/min (6m3/hr) of air through 50m of braided hose to 2 x 1 metre fine-bubble air diffusers. All fittings are included. 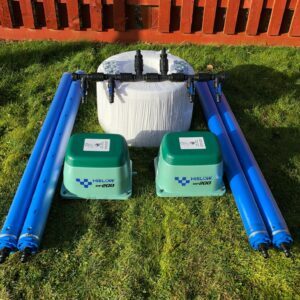 Suitable for ponds & small lakes with depths up to 2.0m and 25m width. 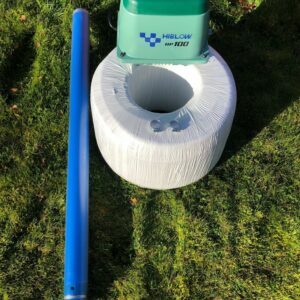 This kit supplies 100lr/min (6m3/hr) of air through 25m of braided hose to a 1m fine-bubble air diffuser. All fittings are included.